Sailors have navigated by the light of Polaris for centuries, but all is not well with the North Star. There's something wrong with its light, and the best explanation might be that it's losing the equivalent of Earth's mass every year. Like all stars, Polaris is made of gas in layers around a core, where nuclear fusion occurs. As its gravity pulls the outermost gas inward, Polaris develops an opaque layer just under the surface that doesn't let light through easily, dimming its glow. Light then builds up beneath this layer and pushes on it like water vapor boiling up under the lid on a saucepan. That light heats the opaque layer, causing it to expand and making it more transparent. The star becomes bigger and brighter until those outer layers of gas fall inward again and the cycle begins anew. The thing is that Polaris's light cycle hasn't remained constant. Observations made way back in 1844 reveal Polaris's pulse used to be 12 minutes slower than it is now, and 168 years of data suggest that Polaris's pulse regularly decreases by about 4.5 seconds each year. 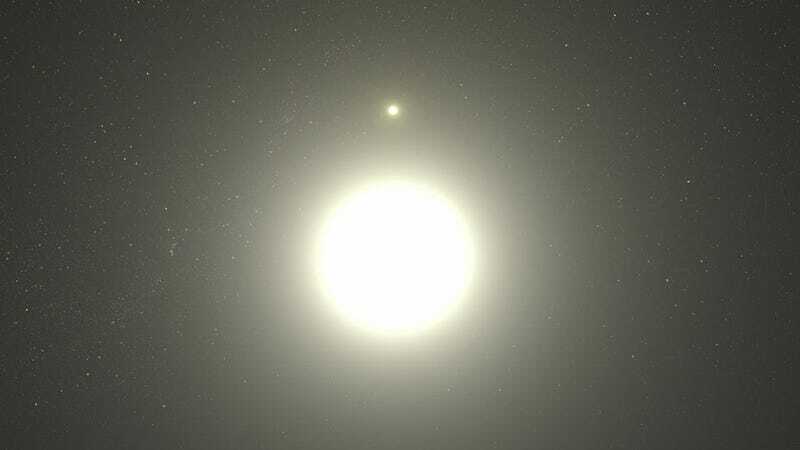 That isn't easily explained by standard theories of star evolution, and the best explanation, according to Neilson, is that Polaris is venting an Earth's worth of mass into space every year, which would throw off the inner workings of the light cycle just enough to account for this big drop. Whatever is going on with Polaris, here's the good news - it shouldn't affect your ability to navigate the seas in search of the New World. (I assume that's what we still use it for, though I did never get past the 1480s in my history textbook.) Neilson says this mass loss is likely just a brief episode in the star's larger life, and it's not actually wasting away to nothing. Even if that isn't the case, we'll have a new North Star soon enough anyway - Gamma Cephei will move into a closer alignment above the North Pole around the year 3000, so if you can just delay all transoceanic voyages until then, you should be all set. For more on this story, check out ScienceNOW. Original paper at The Astrophysical Journal Letters. Artist's conception by NASA, ESA, G. Bacon (STScI).